Woodland Park Zoo’s lush habitat often attracts local wildlife. 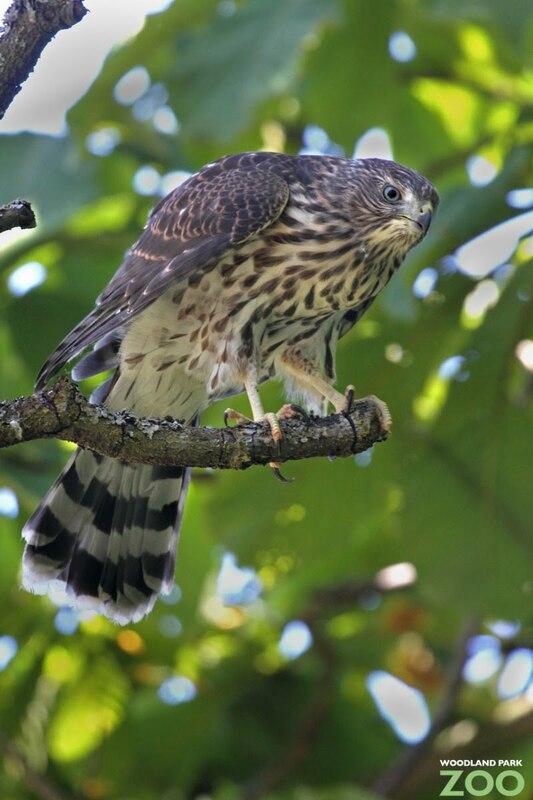 For the first time, we’ve confirmed that wild Cooper’s hawks are nesting here on zoo grounds. Their nest has been spotted in the chestnut tree in the wallaroo exhibit in our Australasia biome. The pair has successfully fledged three young birds which are still heard around the zoo food begging from time to time. They are learning to hunt on their own at this point, but they still get an occasional meal from their parents. Both adults are second year birds meaning they both hatched in 2009. We can tell this by their plumage since they are currently molting from their immature plumage (which they keep for one year) into their adult plumage. Often the nests of younger, less experienced birds are not successful or they raise fewer young, so it has been fun to see this young couple do so well with their fledglings. 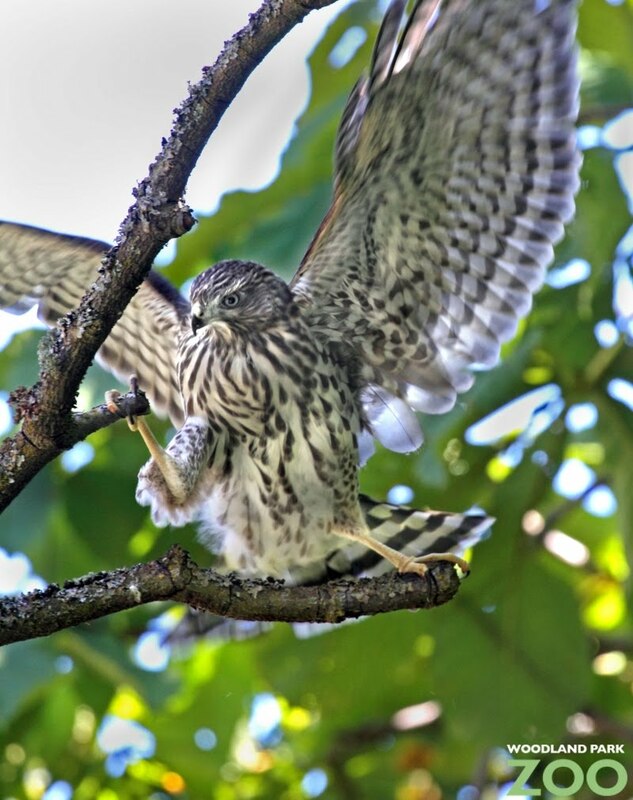 To get a better understanding of the population of Cooper’s hawks in the area and their patterns, a local raptor biologist has been banding as many birds as he can so they can be identified and visually tracked. In fact, the adult male from this nest was banded as a fledgling from a nest in a Queen Anne park. And the adult female as well as two of the fledglings have now also been banded. 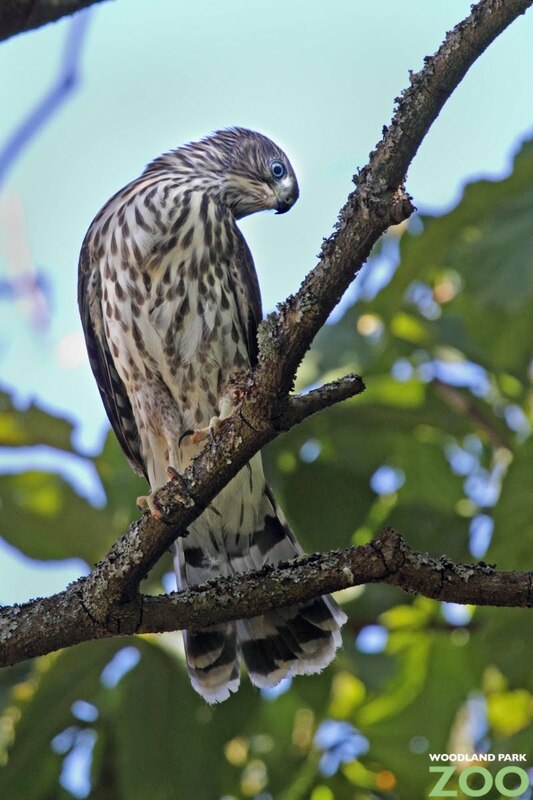 If you ever spot a Cooper’s hawk with a band, please let the zoo know so we can help record the data for this study. Just email webkeeper@zoo.org to let us know where you saw the bird, if the color band is on the right or left leg, and if you were able to see details of the band (will need binoculars for that!) including the ID number. Below is an example of how the bands look. Will this pair remain at the zoo? If they survive the winter they may stay together and will probably nest in the same general area again next year. Cooper's hawks sometimes will use the same nest again but more often they will build a new nest for the next year. They sometimes start work on a few nests in the spring before choosing the final nest. You can learn more about raptors and see them in flight at one of our Raptor Flight Programs. Hawk photos by Dennis Dow/Woodland Park Zoo. Band photo by Jack Bettesworth. Since I live within half a mile of the zoo, I wonder if one of them flies near my house on occasion (I've seen one in our tree). Great news about the fledglings! It's possible. Through the banding study, we’ve seen the number of known nesting Cooper’s hawks in Seattle explode over the last several years. In Seattle, they almost always nest in the larger parks and greenbelts. 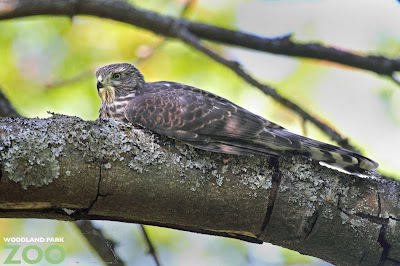 There is also another pair of Cooper’s hawks in the neighborhood nesting in lower Woodland Park. Found a Cooper Hawk in the road @6600 block of Greenwood. Crows were ready to munch on him. Was able to get him to Paws in Lynnwood. He was tagged with a DS. Hope it was just head trauma, no obvious injury. Jack, who tagged him says he knows the bird.